Using SuperBee Wax Wraps is not just about cutting down on plastic but ensuring that the best, cleanest and healthiest materials come into contact with your food while also supporting other responsible and sustainable businesses and producers. It’s a lot to ask from a little wrap, but they’re up for the job! Handmade at our Beehive outside of Chiang Mai in northern Thailand, SuperBee Wax Wraps are made from organic cotton fabric and a waxy mixture of organic coconut oil, tree resin and, of course, beeswax. Since beeswax is not a man-made material you may be thinking that all beeswax is all-natural but that’s not necessarily true. It’s also not always gathered or processed in a way that’s clean and friendly to the environment or bees. To make sure we use the high quality and most natural beeswax we can, we work with a local beekeeper cooperative near where we’re based. The cooperative places and maintains bee boxes throughout the region on farms that do not use pesticides so the bees and wax are pure. 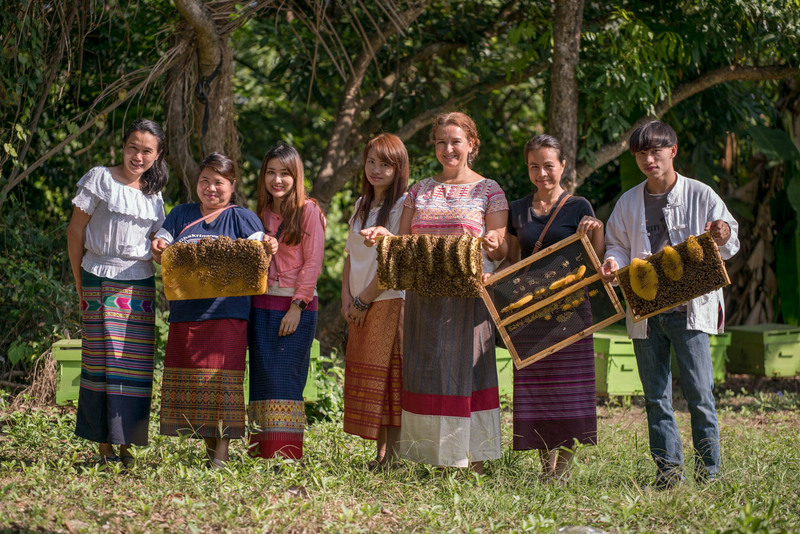 The beekeepers then sustainably harvest the excess wax that oozes from the frames so that the bees and their home are disturbed as little as possible. When we recently visited a nearby farm with our team, the bees were so busy (and we’d like to think happy) that they weren’t even bothered when we removed racks to collect some honey. We could hold the racks with the bees on them without being bothered or stung! Just casually walking with racks full of bees…and no protection! After harvesting the wax from the bee boxes, the farmers then melt and strain the honeycomb to purify it even further before sending it to the SuperBee Beehive. We get big blocks of the cleaned wax ready to make our own sticky solution that we then brush on to the cotton wraps. Because of its sustainable and hygienic properties, beeswax is a natural fit when it comes to helping store and protect food and we think the beeswax we use is the best around! Try our reusable Wax Wraps for yourself here!